City standard expected to balance safety with cost. It doesn't go far enough, Goldfinger says. Three years ago, Chris Goldfinger featured prominently in a Pulitzer Prize-winning New Yorker article that drove a new public awareness of the surprising odds that a subduction earthquake off the coast of Oregon could devastate the Pacific Northwest. Despite a newfound scientific celebrity that extends nationwide, however, the marine geologist's recent activities in Portland have taught a very old lesson — it's hard to fight City Hall. Goldfinger testified in May before the City Council, warning of the potential of devastation for the city — particularly for older buildings constructed of brick or other unreinforced masonry that are most likely to collapse when an earthquake hits, which are a large portion of Portland's buildings. Goldfinger's message, however, has been largely drowned out by property owners and landlords who say requiring retrofits for privately-owned buildings is both prohibitive and beyond their means. 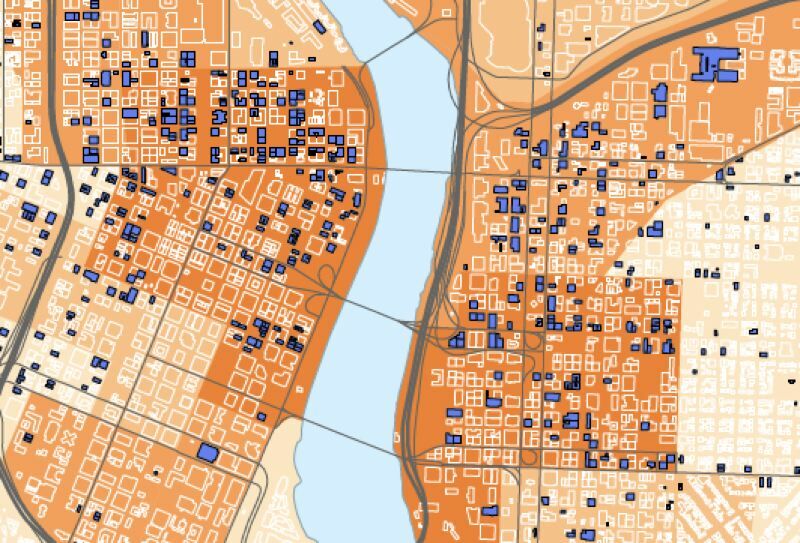 Goldfinger says the resistance in part is because the implications of state data — showing the correlation between unreinforced-masonry buildings in central Portland and the state's projections of expected casualties on a block-level and neighborhood basis — are not well understood. 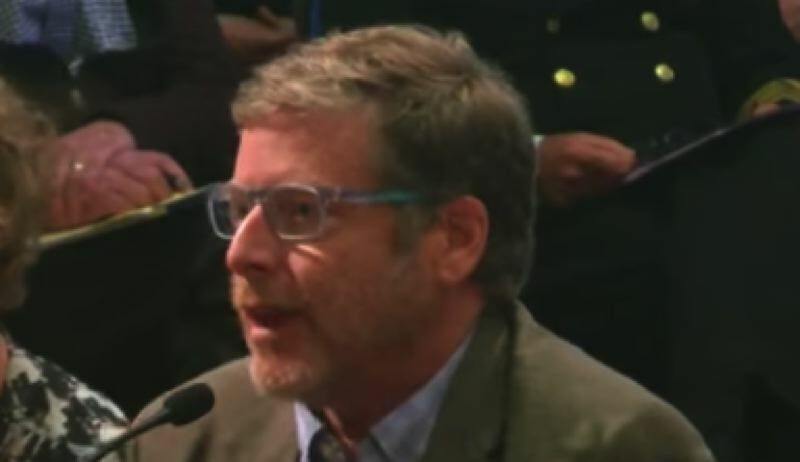 At its June 13 meeting, a majority of the City Council appears poised to to adopt a resolution that falls short of the stricter standard that Goldfinger thinks is called for. The council is leaning toward giving private building owners 20 years to make retrofits, not the 10 recommended by city staff. Goldfinger's concern is based on the number of very old, collapse-prone buildings here, he says, calling Portland "a turn-of-the-century city essentially built on a time bomb." When the bomb goes off is the question. The risk that a magnitude-8 subduction zone earthquake occurs off the coast has been calculated at roughly one in four in the next 50 years. The likelihood of a larger, magnitude-9 subduction earthquake is thought to be 10 to 15 percent in the next 50 years. 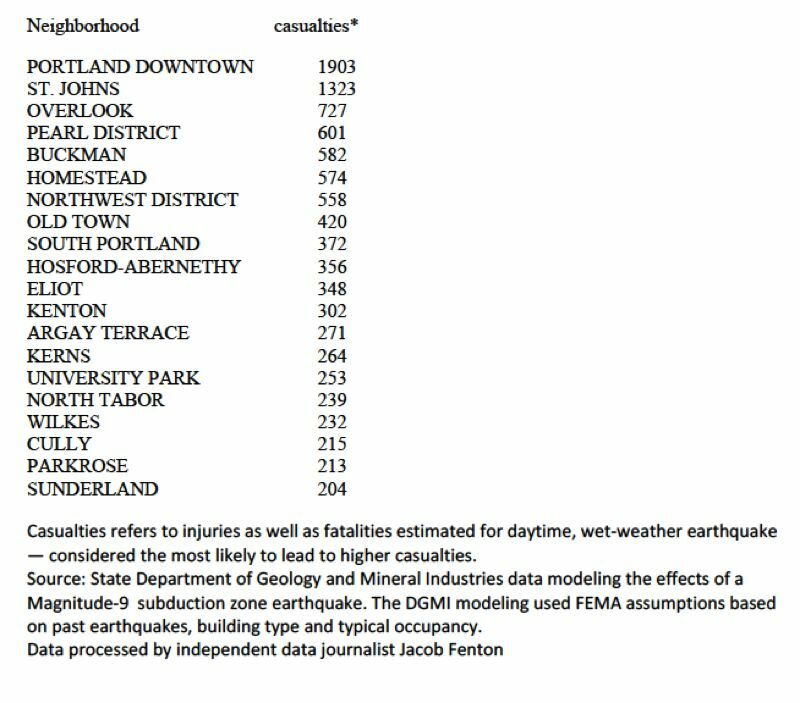 That's the size of quake that state geologists in March modeled to estimate casualties of as many as 15,000 people injured or killed in the city of Portland, and nearly twice that figure in the tri-county region. Such a quake is expected to lead to the collapse of several hundred unreinforced masonry buildings, and damage or destroy key local infrastructure such as bridges. Goldfinger says that probability of this happening is greater than it looks — and the probability doesn't take into account the risk from two other types of potential quakes that are quite possible considering the known fault-lines and other geological features underneath Portland. "I think people underestimate the risk based on hearing a number," he says, "and I think they also hugely underestimate the risk simply because two of the three fault sources (of risk) are completely left out of the number." Rather than focusing only on the likelihood of a subduction earthquake, he adds, "The only thing that matters is the next earthquake, right?" While he is sympathetic to saving historic buildings — the rallying cry of the retrofit skeptics — he says that's not possible without retrofitting the buildings. Otherwise, "It's just a matter of timing when they will be destroyed." Here are excerpts from the Tribune's recent interviews of Goldfinger, 62, who is director of the Active Tectonics Lab at Oregon State University. They are edited for clarity and brevity. Portland Tribune: City commissioners seem likely to adopt less stringent requirements than were recommended by an expert report. Chris Goldfinger: It's good to take a first step, but this is a very weak first step. I mean, Los Angeles started doing things like this after their Long Beach earthquake in 1933, so it's safe to say they're 80, 90 years ahead of us or so. And San Francisco likewise ... Oregon is just far far behind. Somebody at some point is just going to have to bite the bullet and resist the economic pressure and start us down this path; otherwise, as (block mapping the city's collapse-prone buildings) points out, it's not going to end well. PT: It seems like your academic work sucked you into almost being an advocate. CG: I'm an academic and I don't really advocate for things. On the other hand, there's a big gap there between the public and the agencies and the academics. The agencies are very constrained in what they can say without incurring some political wrath. So that leaves almost nobody who can say what they think. Those of us who work in this field are inevitably drawn in to fill the information gap so that people have the right information to make sensible decisions. PT: And the Bureau of Emergency Management invited you to testify? CG: They are in the position of trying to do something good for the public, but they also don't want to be seen as an agency run amok ... I was there to make the point that virtually the entire scientific community supports what they are doing. PT: What do you make of the politics around retrofitting buildings so far? CG: The opposition to it by some very well organized building owners was very strong, which was surprising. The measure was essentially just down to brace-and-parapets, which is just the absolute minimum that you can do. I was very surprised that more people didn't show up to speak for the hazards, about all the unreinforced-masonry schools that we have and all the places like that. I was surprised to see it come down to essentially just profit margin versus safety in such an obvious way. PT: What else could the city be discussing? CG: Things like placarding buildings so that when people go in and out they're made aware of the hazard ... One of the cheapest, simplest steps you could take is to at least give people information to make their own decisions. 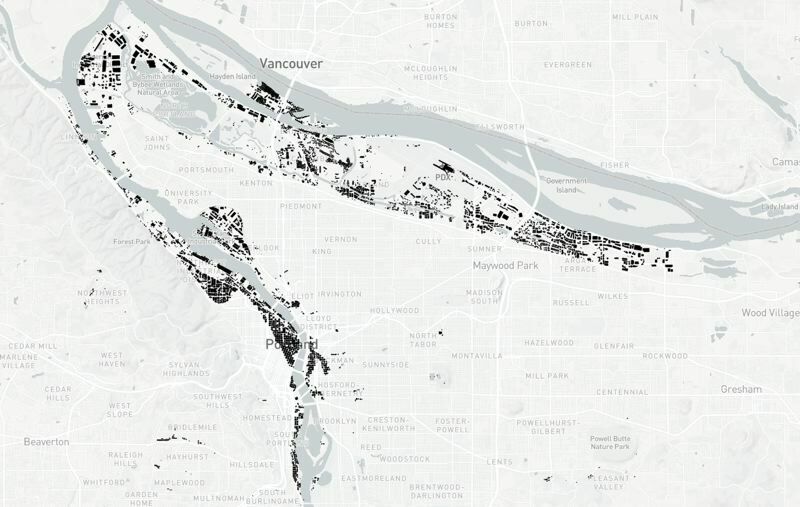 Independent data journalist Jacob Fenton analyzed state Department of Geology and Mineral Industries data showing soil types, building location and block-level casualty estimates to map the impacts of a magnitude-9 Portland quake on Portland.